Adrienne and I are hosting #GoingGreen for the last time this year, and we have something special to focus on - Christmas. 'Tis the season for crafts and recipes. Pinterest might as well cover itself in tinsel and turn on those Christmas lights, because it is full of cookies, ornaments, and present ideas. Not to mention that Elf. Do not fear if your blog doesn't contain any of these things. All is not lost. I do not have a lot of craft or recipe posts, but I do have a few Christmas posts that bring in traffic from search engines as the holiday season nears. Yesterday I took the time to go back to my favorite Christmas posts and spruce them up. 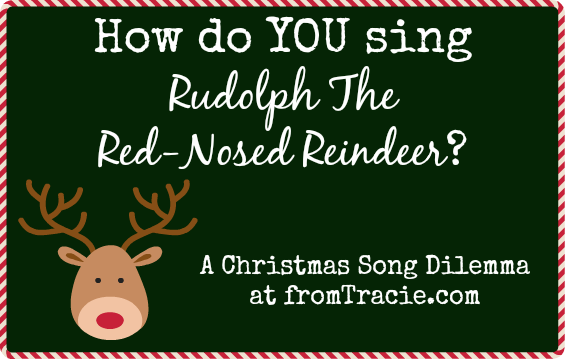 I made a Pinterest-worthy graphic for this post about my family's yearly Christmas dilemma: What are the extra words to Rudolph The Red-Nosed Reindeer? Further proving my family's inability to sing Christmas Carols together, I gave a spruce to this post about our yearly tradition of looking at Christmas lights on Christmas Eve while wearing pj's, drinking hot chocolate, and getting all of the lyrics wrong. It didn't need a lot of work, but I have settled into a formatting style that is quite different in 2013 than it was in 2009 when that post was originally written (example: no more crazy fonts). When you look at that post now, it feels like it fits on this blog. And finally, I refreshed this post about making the perfect Christmas card. Every blogger especially needs to see this, because I have turned writing your Christmas letter into a quick and easy process. Now that you have seen mine, I want to see yours! What is your favorite Christmas post that should be read this year? Maybe it is something you wrote when you were new to blogging, and the only person reading your blog was your best friend and that guy in Russia. Or maybe it is just a great story or tutorial, and you want to give it another chance in the spotlight. Link it up with me and Adrienne (who has awesome tips for making a Jesse Tree). It is easy to participate in #Going Green. Share your favorite recipe, DIY, or Christmas memory. Where were you on your blogging journey a year ago this month, two years ago, three? Write about it. How has Christmas changed as your kids have gotten older? Give us a “then and now” style post. Go green in whatever way feels right to you. 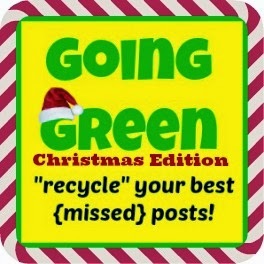 It does not matter how you recycle that great post, as long as it’s relevant to Christmas or the holidays. Add images to make your post Pinterest friendly. Make sure your post is SEO friendly, and allow comments on old posts. Be sure to have share buttons installed so others can easily share your post. Link to your blog post below and visit others on the list! Be sure to link the URL to your actual post and not your blog’s home page. Spread the word and invite others to link up all month long. That’s right. All month! We want to give you a chance to really visit others and build your blog community! Put your old blog posts to work for you, and spend time visiting others. Doesn’t that sound like a great way to make the most of your blogging time this month? Be sure to grab the badge code and include it in your posts. Connect with @TheMommyMess and @FromTracie on twitter, and be sure to use the hashtag #GoingGreen! We are super excited to see all of your best missed Christmas posts! *Try to visit at least two posts from the linky and leave some comment love after you add your link. All bloggers want comments for Christmas. We just brought all the stuff down yesterday, things are still getting set up. We haven't even started decorating for Christmas at my house yet. Whew. And there is such a short time between Thanksgiving and Christmas this year, the time is flying fast. Just found one to link up! What fun. Awesome!! I'm excited you are joining in on the fun. Okay- I am back to do this!! Wait just a minute and I will link up!! WOOHOO!!! Ok if I put in one from today about the Special Breakfast? Oh would you rather a specially crafted one? You can ABSOLUTELY put in the Special Breakfast post. It is awesome, and exactly perfect. I should totally do this ... I'm just lazy right now. But maybe ...! In the meantime I'll go check out everyone else's posts!